I hope you are all having a happy holiday whether you celebrate Christmas or not. It’s been a very busy time here Beside the Sea. I can announce that the blackwork project Pentecost 2 is finally finished BUT I can’t share a photo of the completed stitching just yet because Claire is also on the final straight and we agreed to publish our happy dance together. I’m sure you won’t have to wait too long to see it. In the meantime, I thought I’d share some links to the lovely crafters who sent me nice Christmas goodies in the post this year. 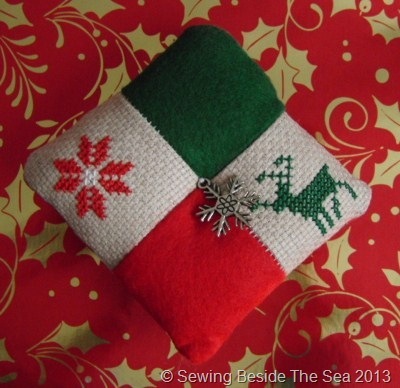 First up is Angela from Pretty Little Things in a Box who sent me a gorgeous handmade pincushion in traditional Christmas colours with a cute metallic snowflake. I love Angela’s blog. There is such a variety of projects to sew and reading Angela’s posts always gives me lots of inspiration and smiles. 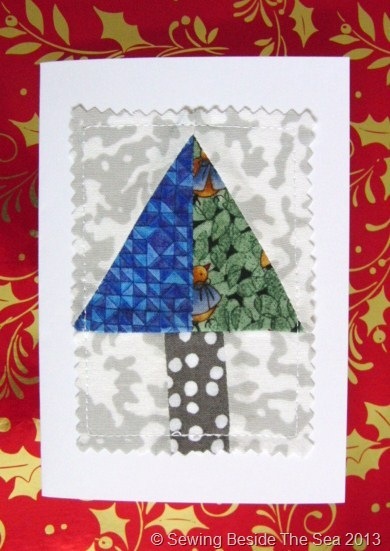 Next, this card arrived from my dear friend Teje in Crete. Teje’s blog was one of the first I followed when I started my other blog almost two years ago. 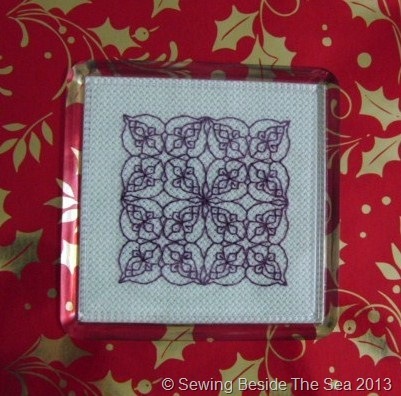 Look at these beautiful handmade tree decorations…..
…..and a hand embroidered blackwork coaster in my favourite colour. 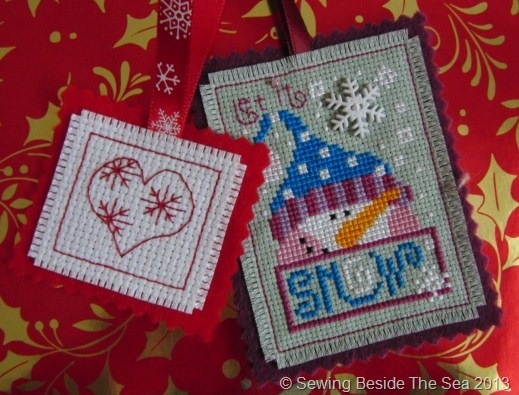 Claire is another one of those generous crafters who loves to share her ideas and some of her own lovely cross stitch designs are free to download on her blog Claire93. If you would prefer to read her French blog you can find it here. I am now so far behind in reading your blogs and I haven’t posted on my other blog Oh Sew Tempting for ages! My aim over the next few evenings is to catch up on what you have all been doing. See you soon and best wishes for 2014! Such lovely gifts for a lovely person. They made me smile and that’s what it’s all about 🙂 Best wishes for 2014. I’ve been searching online all day for thread for my next project. I can’t seem to find the right one….